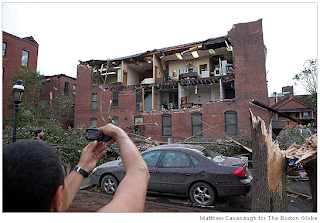 cryptonaut-in-exile: Tornadoes hit Western, Central Mass. Tornadoes hit Western, Central Mass. Tornadoes tore through Western and Central Massachusetts yesterday, killing at least four people, injuring an untold number, and reducing schools, churches, and homes to splinters along its destructive path. It looks like Springfield took the brunt of it, but it's not clear if the extent of the damage has been reported yet. So far I've heard all clear signs from family and friends in and near the Pioneer Valley. My Facebook feed is loaded with storm stories again this morning.